The only way to truly experience the backcountry east of Gold Beach is to spend some time with the locals: eat, sleep, shop, see the sights and get your feet wet. Follow the Rogue River from the rugged Pacific Coast along what is called Jerry’s Flat Rd. inland to the little town called Agness and take a step back in time. Your 35-mile sojourn from the coast will take you through a slow corridor lined with giant conifers on one side and the rushing river on the other. 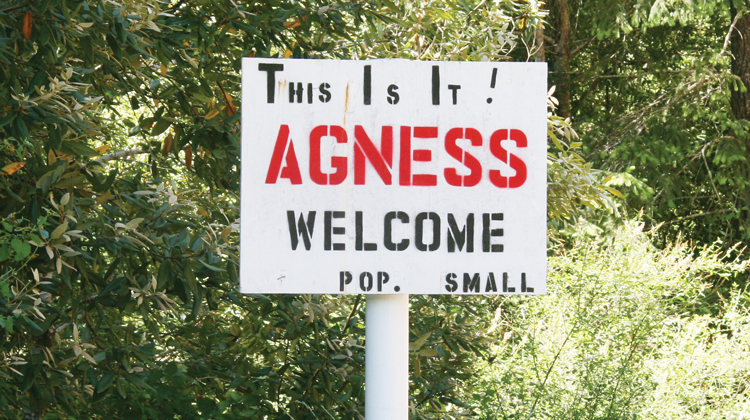 What you will find when you reach the village of Agness is a century-old riverside experience. Singing Springs Resort offers Rogue River visitors well-known hospitality, fine food, casual overnight accommodations and an escape from the hustle of everyday life. It is known for its friendly atmosphere. They feature experienced driftboat operators and fishing guides on the Rogue. Cougar Lane Lodge is a favorite stop after the drive from Hwy 101 to Agness. The Cougar Lane Lodge has it all: a full restaurant and bar, a country grocery store complete with gas and fishing supplies, and a comfortable motel. Pack a picnic, rig your fishin’ pole and get down to the river bar for a day you won’t forget. Illahe Lodge has been providing guest lodging with meals in its relaxed country home setting since 1942. Meals are served family-style, and many of the fruits and vegetables they serve come from their own garden and orchards, just as they have since the lodge was built. The Illahe Lodge overlooks the Rogue River Trail, and is accessible by car.